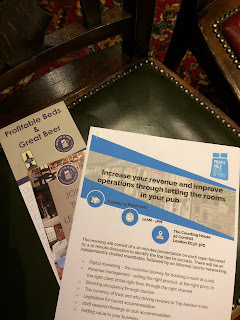 The pub sector has joined forces behind a new industry initiative to promote staying in pubs as an alternative to hotels. The second Profitable Beds in Pubs event took place in London this week, with representatives from: the Association of Licensed Multiple Retailers, Guestline, In a Pub and Stay in a Pub hearing from delegates on the growing consumer trend of overnight pub stays. Speakers highlighted the importance of businesses standing out in an emerging marketplace and provided tips on maximising offerings and connecting with customers. Topics discussed included digital marketing for pub accommodation, revenue management, the importance of managing guest reviews, the impact of tourist accommodation legislation and a presentation of research findings on pub accommodation. ALMR Director of Communications Tony Sophoclides said: “Buoyed by a burgeoning consumer preference for boutique and character-driven accommodation, pubs are in a great position to capitalise and evolve their businesses. It is absolutely vital that any pubs looking to begin offering accommodation, or enhance their current accommodation offerings, are fully aware of the opportunities and pitfalls of this exciting sector. When picking your dish plan you have PetLovesBest As Spencer was eating his PetPlate meal. Thank you very much for sharing interesting stuff. So friends as you know there are many surveys around him but here we provide you the some biggest survey sites which provide the big cash and more prize so check out this list. well, your this piece of content is awesome and i must say that you add me in the list of your subscription list. If you have any degree but not satisfied with the job, then apply for the best Mobile Repairing Institute in Delhi in just 2-3 months. Join ABC Led Lcd Repairing Course, the best Mobile Training Course in Delhi which provide full information about Mobile, LED LCD, CCTV and Laptop Training Course. We have trained and highly experienced faculty staff. Contact us now at 9990879879. Good info! keep sharing it. Shadow Fiend. tellthebell. is offering a great chance for its customers to win $500 who take part in the feedback after going to the restaurant.